It's National Watermelon Day, and such a momentous summer occasion calls for a watermelon margarita recipe, don't you think?! Some of these food holidays get a little out of control, but when it comes to watermelon, I do not mess around. I'm really not much of a melon gal, but watermelon in the depths of summer I'll take any day. 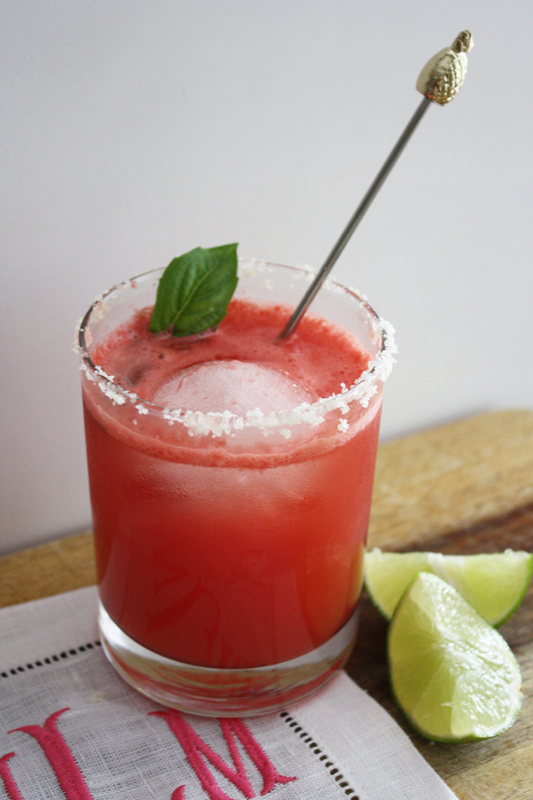 This watermelon margarita recipe uses simple ingredients plus one very special addition: lime sea salt. Trust me when I say that the lime salt absolutely MAKES this beverage and kicks it up to the notch that it deserves to be at. 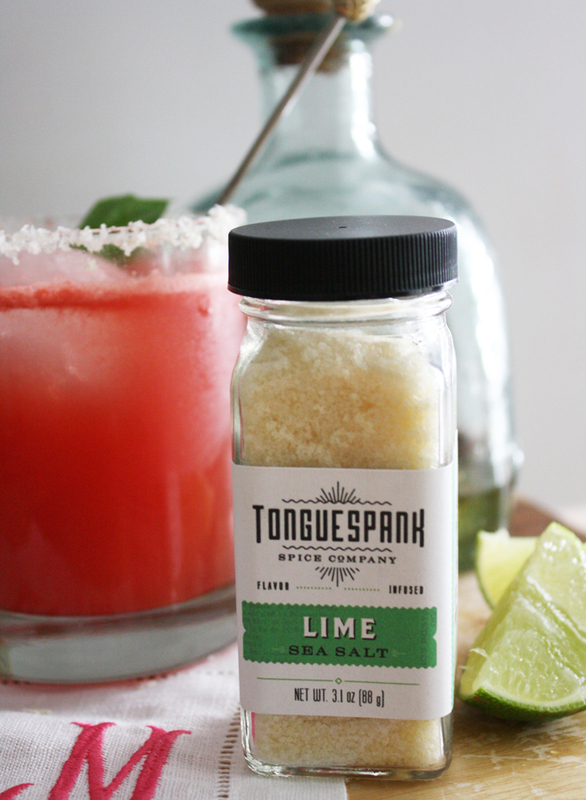 Tonguespank was kind enough to send over a jar of this happy little spice to serve as the drink rimmer for the margarita, and it is total perfection. Based out of Chicago, Illinois, Tonguespank's mission is to bring even more flavor to the foods that people eat every day. The company has made its mark with their liquor and heat collection which combine your favorite liquors with some unexpected spice. Flavors such as citrus rum and smokey bourbon have me dreaming up all kinds of concoctions (Bloody Mary anyone?). But in the meantime, I'm excited to toss some lime sea salt on just about anything, and another salty treat is coming your way soon. Delicious! Blend watermelon & juice of 1/2 lime in a blender until smooth. Strain watermelon through sieve to eliminate large fruits remnants. 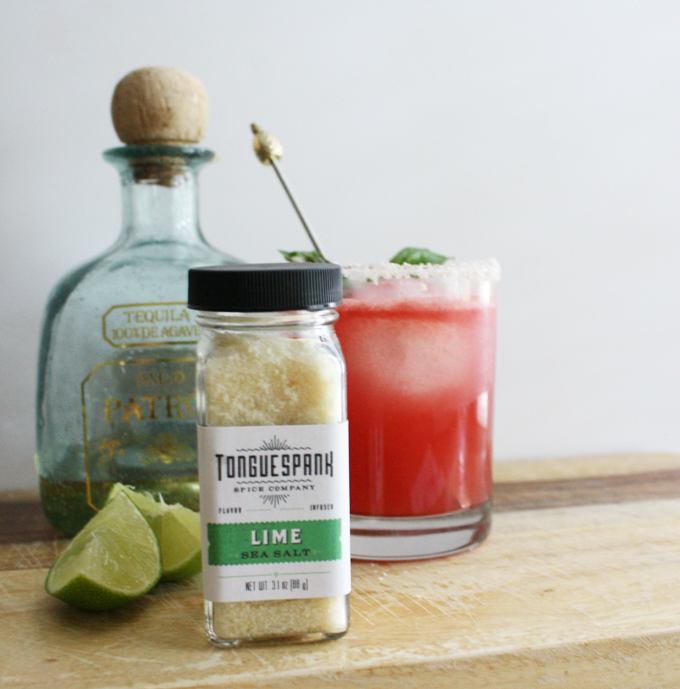 Add ice, tequila, & strained watermelon juice to a cocktail shaker. Shake well. Add salt to a small plate and rim your glass with remaining lime half. Gently spin glass in salt to create a salt rim. Add ice to your class and pour watermelon cocktail from shaker. Enjoy! How refreshing!! What a great cocktail for a party - can't wait to try this!